I am glad my daughter persuaded me to help her bake these tasty Cream Puffs for this Valentine’s Day. 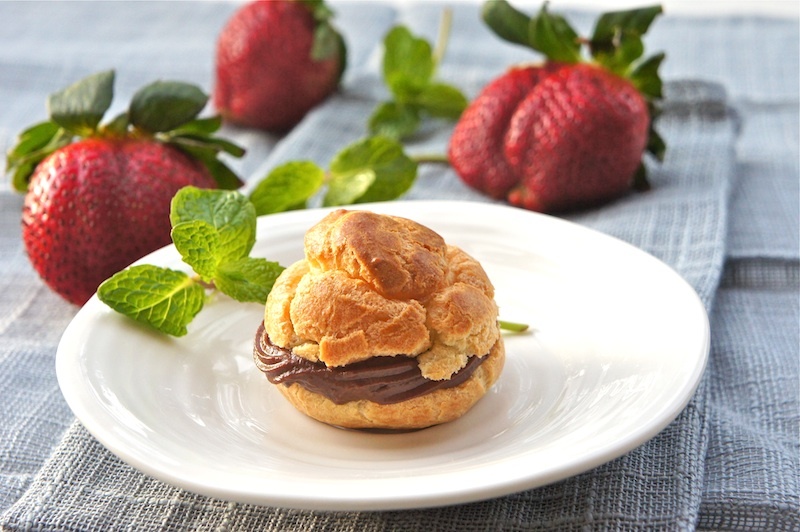 I was pleasantly surprised at how easy it was to make these versatile Cream Puffs. You need to apply a bit of strength to stir the dough; but, the result is well worth the effort! They baked beautifully to a golden colored cream puff in the oven pretty quick. We baked several batches of these puffs. So tasty and versatile, you can fill it with pastry cream, ice cream, or a savory filling of your choice. I should disclose that prior to this, I’ve never had any cream puffs before. Never cross my mind to include it to my “to bake” list, embarrassing. Anyway, better late than never I suppose. In the end, we decided to fill the cream puffs with vanilla and chocolate pastry cream. Whichever filling you choose, I urge you to give this recipe a try! A very Happy Valentine’s Day to all! Position the racks to divide the oven into thirds and preheat the oven to 425˚F. Line two baking sheets with silicone baking mats or parchment paper. Bring the milk, water, butter, sugar, and salt to a rapid boil in a medium heavy-bottomed saucepan over high heat. Add the flour all at once, lower the heat to medium-low, and immediately start stirring energetically with a wooden spoon or heavy whisk. The dough will come together, and a light crust will form on the bottom of the pan. Keep stirring-with vigor-for another minute or two to dry the dough. The dough should be very smooth. Turn the dough into the bowl of a stand mixer fitted with the paddle attachment or into a bowl you can use to mix with a hand mixer or a wooden spoon and elbow grease. Let the dough sit for a minute, then add the eggs one by one and beat, beat, beat until the dough is thick and shiny. Make sure that each egg is completely incorporated before you add the next, and don’t be concerned if the dough falls apart-by the time the last egg goes in, the dough will come together again. Once the dough is made, it should be used immediately. Slide the baking sheets into the oven and immediately turn the oven temperature down to 375˚F. Bake for 12 minutes, then rotate the pans from front to back and top to bottom. Continue baking until the puffs are golden, firm, and, of course, puffed, another 12 to 15 minutes or so. Allow the puffs to cool on the baking sheet. To fill the puffs: Using a serrated knife and gentle sawing motion, you can simply cut off the top quarter or third of each puff, fill the puffs, and top them with the little caps. Or, if you’re using a very creamy filling, you can fill a piping bag fitted with a small plain tip with the filling, then use the tip to poke a hole in the side of each puff and squeeze in the filling. Bring the milk to a boil in small saucepan or in a microwave oven. Meanwhile, in a medium heavy-bottomed saucepan, whisk the yolks together with the sugar and cornstarch until thick and well blended. Whisking without stop, drizzle in about ¼ cup of the hot milk-this will temper, or warm, the yolks-then, still whisking, add the remainder of the milk in a steady stream. Put the pan over medium heat and, whisking vigorously, constantly, and thoroughly (make sure to get into the edges of the pan), bring the mixture to a boil. Keep at a boil-still whisking-for 1 to 2 minutes, then pull the pan from the heat. Whisk in the vanilla extract. Let stand for 5 minutes, then whisk in the bits of butter, stirring until the butter is fully incorporated and the pastry cream is smooth and silky. Scrape the cream into a bowl. You can press a piece of plastic wrap against the surface of the custard to create an airtight seal and refrigerate the pastry cream until cold or, if you want to cool the custard quickly-put the bowl with the pastry cream into a larger bowl filled with ice cubes and cold water and stir the pastry cream occasionally until it is thoroughly chilled, about 20 minutes. Meanwhile, in a medium heavy-bottomed saucepan, whisk the yolks together with the sugar, cornstarch, salt until thick and well blended. Whisking without stop, drizzle in about ¼ cup of the hot milk-this will temper, or warm, the yolks-then, still whisking, add the remainder of the milk in a steady stream. Put the pan over medium heat and, whisking vigorously, constantly, and thoroughly (make sure to get into the edges of the pan), bring the mixture to a boil. Keep at a boil-still whisking-for 1 to 2 minutes, then pull the pan from the heat. Whisk in the vanilla melted chocolate. Let stand for 5 minutes, then whisk in the bits of butter, stirring until the butter is fully incorporated and the custard is smooth and silky. Scrape the cream into a bowl. You can press a piece of plastic wrap against the surface of the custard to create an airtight seal and refrigerate the pastry cream until cold or, if you want to cool the custard quickly-put the bowl with the pastry cream into a larger bowl filled with ice cubes and cold water and stir the custard occasionally until it is thoroughly chilled, about 20 minutes. These look delicious! I am on a sweet and salty kick lately! I love sea salt and chocolate! 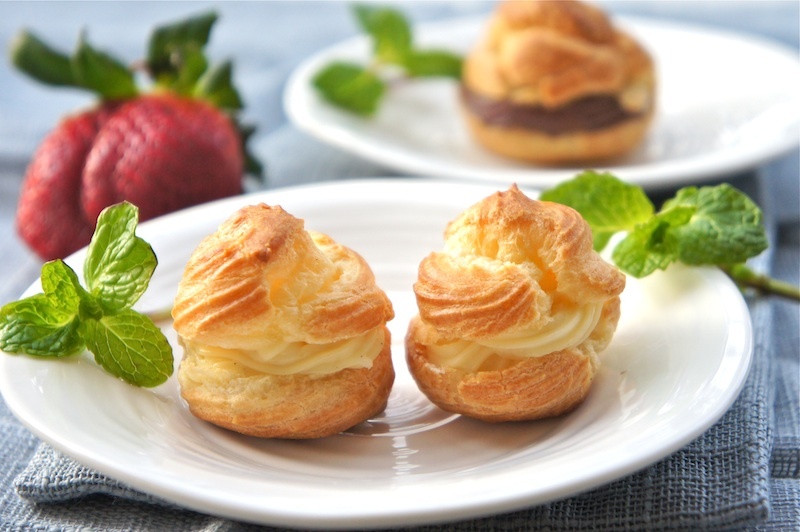 my hubby just requested homemade cream puffs last week! perfect :) since i had no idea how to make them! These look like such a great treat! For a first timer, you definitely look like a pro! @Jennifer: Thanks. I love sea salt and chocolate too. @Lindsay @ The Lean Green Bean: Perfect! @The Sweetylicious & @Peggy: Thanks for the compliments. @Joy: Thanks. I love them too! I just baked them and they look soooo perfect! They are so cute, I can't take my eyes off them! Thank you, thank you! Tried it, it didn't come out well for me. The dough was too watery, it didn't form into a dough until I added another cup of flour. I followed the steps exactly. I don't know what's wrong with my dough :( I tried baking them, came out flat instead of rising. @Anonymous: I think you need to stir the dough a bit longer. This is a good recipe and give it another try, thanks.